Arunachal Pradesh Governor BD Mishra stressed that the Sainik School in the State must start from August 27 as scheduled and all required formalities and admission process should be completed on time. 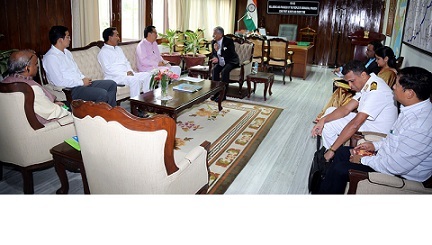 Governor Mishra said this while chairing a high-level meeting on the Sainik School of the State at the Raj Bhavan in Itanagar on Thursday. Deputy Chief Minister Chowna Mein, Minister Education Honchun Ngandam, Sports Minister Dr Mohesh Chai, Chief Secretary Satya Gopal; Secretary, Education Madhu Rani Teotia; Sports Director Tadar Appa and Captain Edwin Jothirajan, principal, Sainik School, Goalpara, Assam attended the meeting. The Governor underscored that one of the three Sainik schools, sanctioned for the State, “must be one of best schools in the country”. The Governor urged upon all stakeholders to put in a joint effort in providing the best Sainik school in the country to the children. Captain Edwin Jothirajan, principal, Sainik School, Goalpara, who is overseeing the work, till regular principal joins, briefed the meeting about the new Sainik school. The Governor advised the State Chief Secretary to pass directions to all the Deputy Commissioner to inform all school children through the Deputy Directors of School Education in the districts and headmasters of the schools to motivate maximum number of students to fill up the forms and appear for first ever entrance examination in Arunachal Pradesh for Sainik School. The prospectus and admission forms would be available online as also in the selected centers and State Government notification. Governor Mishra pointed out that the parents and guardians must be told of the last date for receipt of application, which is July 13. The entrance examination, to be conducted on July 22 at selected centres, will be announced by the State Government. The merit list for interview and medical examination will be published on July 28. The interview and medical examination will be conducted from August 1 to August 4, 2018. The final merit list including waiting list will be published on August 7. Issue of call letters for selected candidates will commence from August 8. Admissions will be done in the school from August 13 to August 16 and the school will start from August 27 this year.